Spring is the perfect time for new growers to start their journey. So many good vegetables can grow right now — not to mention the herb potential. But if you’re a beginner gardener, it can be a little nerve-racking. Here are 13 spring gardening tips for beginners that’ll help you through the growing journey. Gardening is supposed to be fun! And if your garden doesn’t grow just the way you want it to, it’s no big deal. So, don’t worry too much, take the stress off, and remember to have fun. Growing is about the journey — not the results, so relax and appreciate the process. Think of it this way: if you’re new to running, your first race shouldn’t be a marathon. Start with something manageable for you — whether that’s a windowsill herb garden or a patio container garden. Then, you can work your way up to a huge, wonderful garden. It might seem obvious, but make sure to plant something you like and your family will love! If you’re allergic to eggplant or don’t like anything spicy, don’t grow eggplants and jalapenos. Grow something you want to eat — and something you’re excited to share with loved ones. 4. Keep a drink on hand at all times. Your garden will need to be watered consistently. Plan a space that has access to water, or be prepared to carry several cups from the kitchen regularly. It’s best to water your plants at the topsoil level. Rainwater is great for leaves, but the water with a high pH (often from hoses and taps) is not good for leaves, so pour right on to the base of the plant. And then…keep a drink on hand for you! Create a space that you want to be part of — a place you can sit down, read a book, and enjoy a beverage while your garden grows. Know what you want to grow and make sure it’s a good fit for where you live. It’s best to prepare for your garden. Don’t just buy plants on a whim. Plan for all the needs of a garden, including soil, container, plant food, nutrients, and the time required to actually plant. For beginner gardeners, a little planning goes a long way. It can be difficult to figure out when to plant your garden. The best gardening tip for beginners? Count backward! Figure out when the vegetable can harvest (and when you want it to), find the length of maturation for your veggie, and you’ll be able to see when you need to plant. 7. Plan around your space. The best part about gardening trends right now? You don’t need an entire backyard, a roof, or even a patio. Look at your space and find your garden options. Do you have a fire escape? Porch? Windowsill? If you only have a small patio, think about container gardens. If you’re planting on a fire escape, keep your garden lightweight. If you’re going for an entire vegetable plot, think about how much time it will take to plant. Also, consider your local weather and how much direct sun you get. Plan what you want to grow around the realities of where you live. Don’t be afraid to dig into the dirt — it’s actually healthy for you! Enjoy being outside and get your hands dirty. Scientific research shows that there are real health benefits to playing in the dirt. Then, remember that the dirt you choose matters. 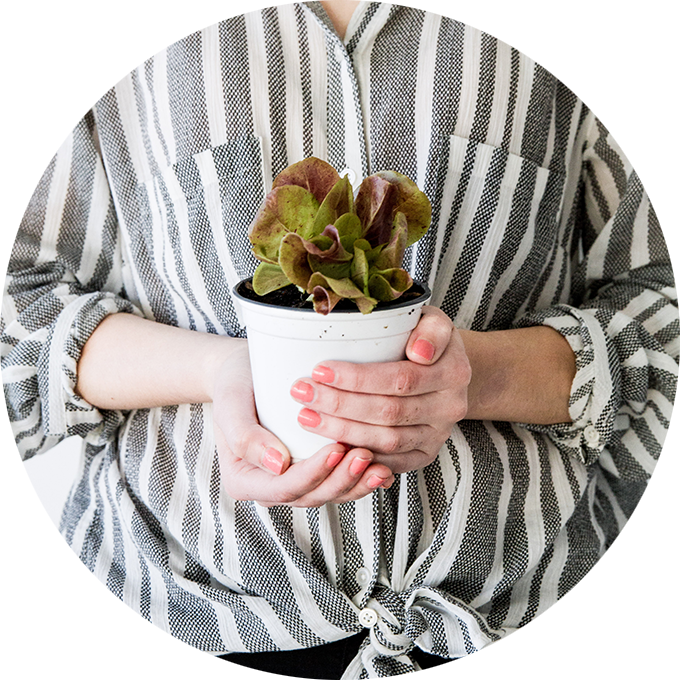 You want to create a happy, healthy home for your plant to thrive in. Every plant has different soil needs (and every bucket of soil is different), so ask around about what dirt will work best for your plant. If you travel five days a week and don’t have access to automatic water, accommodate! Plant a mobile garden or find a garden sitter. Your schedule is real and often inflexible, so work with it. Don’t let business be the reason your garden doesn’t thrive. New to gardening? Start with starter plants, instant gratification is awesome. If you’re a first timer, let your farm partners do the heavy lifting. Instead of planting seeds, start with plants that already have a well-established root system. You can find plants that have survived the tenuous ‘baby’ phase and developed into adolescents. If you decide to purchase seedlings, purchase from someone you know and trust — it matters. Then, tend to your garden accordingly. If unexpected hail is coming your way, think about putting an umbrella or tarp over your garden. If it gets really hot, really fast, water a little more often. When it comes to weather, the thing to remember is to be aware. 12. Find your plant people. Gardening tip for beginners number 12: find a support group! It’s wonderful to have support from people who are on the same journey as you. Plus…it’s just fun to talk about growing. There’s a huge community of growers you can access, full of people who love answering questions and welcoming newbies into the flock. 13. Instagram your precious moments. Don’t be bashful about your garden. Take lots of pictures along the way and share the joy of the harvest — through Instagram, dinner parties, and gifts. The “I grew that” moment feels so good, so share the joy! These gardening tips for beginners will keep you feeling good about your growing journey — if it’s your first time growing or your 30th. Whatever the outcome of your garden, your journey is such a joy, so be sure to enjoy it!